Home heating and cooling made simple. Get the perfect temperature in every room with the only Smart Vent system that adapts to your life. Have a room that's too hot or too cold? Flair eliminates uneven room temperatures, balancing heating and air conditioning across your home. Replace as few or as many vents as you need to make any room comfortable. Flair has the only Smart Vent with over 260 feet of range. Other smart vents can lose signal due to your wifi or microwave. Why should you ever worry about your Smart Vent losing signal? Installation is as simple as taking out your old vent and dropping in a new Smart Vent. Installing a Puck requires no drilling, no wiring, and no wasted Saturdays. This is automated HVAC made simple. Do you want your nursery or baby's room to always be 68 degrees? 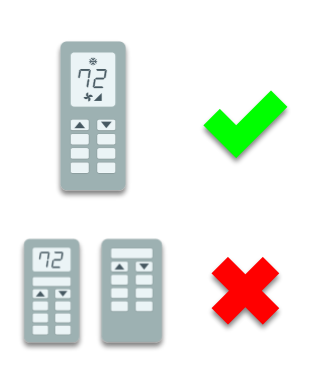 You can set your baby's room temperature to the perfect temperature while the rest of the house is 72. Set the temperature on our iOS, Android, or web app and never worry about adjusting your thermostat ever again. Want more? The app also keeps track of temperature, pressure, humidity, and ambient light of each room that has a Puck. Flair is the only Smart Vent system that's been built with automation from the ground up. Our system can save you up to 30% on your heating and cooling bill. Designed with your home comfort in mind. Other smart vents use plastic. Flair's Smart Vents use 100% steel. That means no yellowing or brittling. Plus, the low-profile means that it sits 55% lower than other vents when installed in floor. No other Smart Vent system features in-room temperature control. That means you can put a Puck in your baby's room and quickly set the temperature at bed time. No need to fiddle with your smart phone. Flair's Smart Vents feature precision on-board HVAC temperature and pressure sensors. They constantly make sure pressure and airflow conditions always remain optimal. We deliver you home comfort safely and efficiently.